Southern Living magazing names Orange Beach Alabama a top 10 weekend getaway and Prickett Properties agrees! Orange Beach Alabama is located on the Alabama/Florida gulf coast line. It is likely that you have heard of Destin or similar Florida vacation spots, but you might not of heard of Orange Beach. Orange Beach has the same white sandy beach and blue gulf waters as more well known Florida locations, but the prices and crowds are lower. Even better, Orange Beach has luxury resorts such as Turquoise Place, Caribe & the Bella Luna that have amenities such as lazy rivers, waterslides, private gulf front hot tubs, gulf front pools, tennis courts, private marinas and more! Orange Beach is truly a hidden gulf coast vacation destination that you should consider for your next luxury family vacation. Book your Orange Beach Luxury Vacation Rental with Prickett Properties and mention that you found us through Chic Family Travels. We will give you $100 off your rental! Oh yeah, did we mention that Orange Beach also has pontoon boat rentals with waterslides for your enjoyment on Ole River? 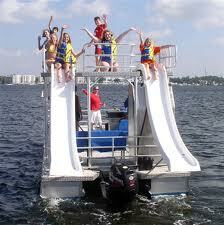 Island hopping on a pontoon boat with a double waterslide. Does it get better than that for a kid? Contact Prickett Properties for the Family Vacation of a lifetime. We promise to make it memorable!